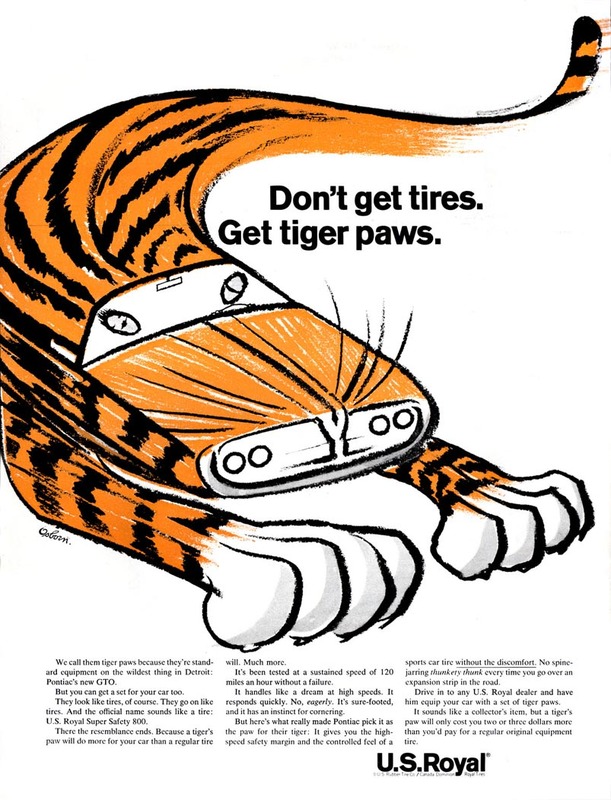 Remember the Uniroyal Tiger Paws? They had the coolest animated commercials when I was a little kid. 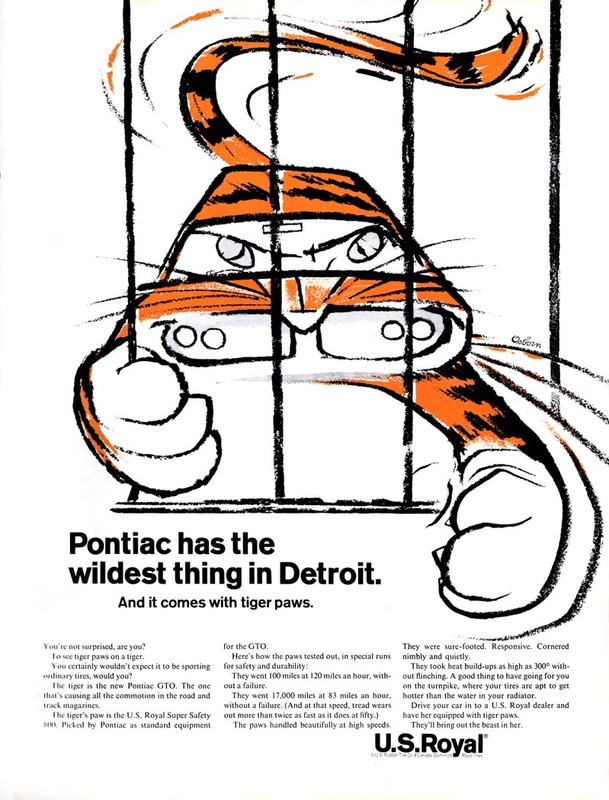 ... but Pau has pointed out that the Tiger Paws was born out of the fertile imagination of cartoonist Robert Osborn. Osborn had a knack for seeing an edgy, slightly ominous quality in his subjects. His characters were never just funny or cute. They often exposed something a bit... unsettling. 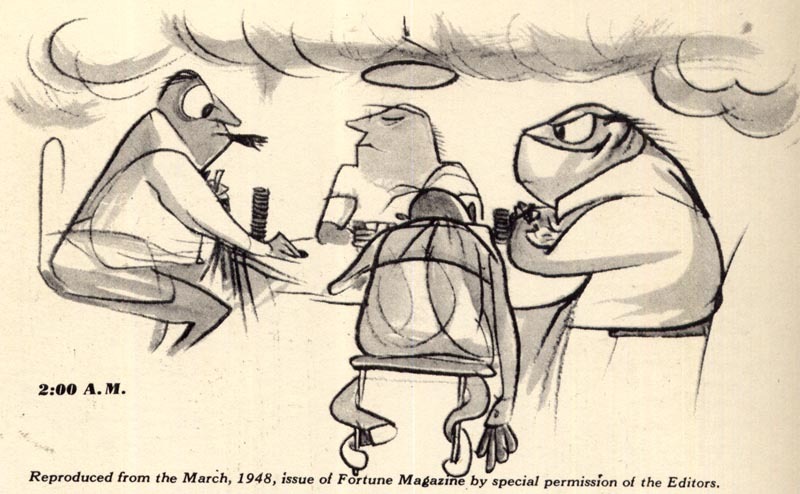 In Gene Byrnes' 1950 book, The Complete Guide to Cartooning, Osborn writes, "It seems to me that any cartoon or painting, or piece of sculpture, can do more than merely copy nature..."
"... a copy never has the 'zing' of the real thing and inevitably seems dead compared to nature. But and artist can bring out of his imagination a new and real thing..."
"... which can stand on its own feet and isn't an imitation of something else." Osborn could easily have been talking about his Tiger Paws creation. Talk about 'zing'! 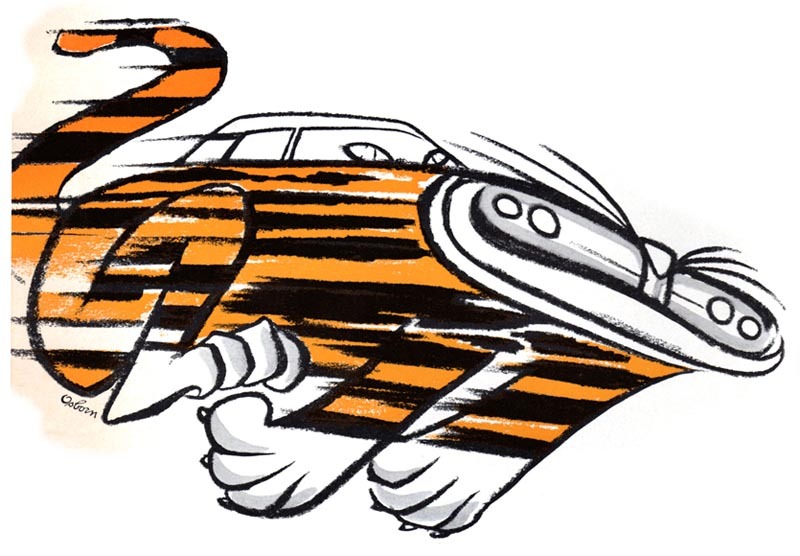 This bizarre hybridization of aggressive predator and aggressive muscle car, born out of Osborn's seemingly limitless imagination, was unlike any other cartoon mascot ever conceived. Cartoon mascots are typically friendly and inviting. Not Osborn's Tiger Paws. 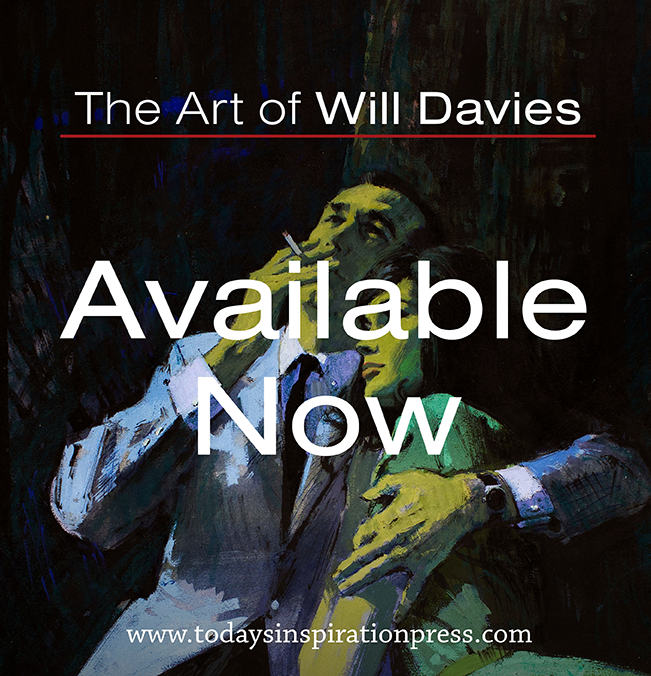 They were designed to appeal to those looking for the cool, the aggressive, the powerful. No cartoonist of the day could have been a more perfect choice to design such a character than Robert Osborn. And here's a first for Today's Inspiration: video! I found a couple of those tv commercials from back in the day. Now that I know the Tiger Paws character was created by Osborn, it gives seeing these again a new depth and perspective. Enjoy, youngsters! They don't make 'em like this any more! 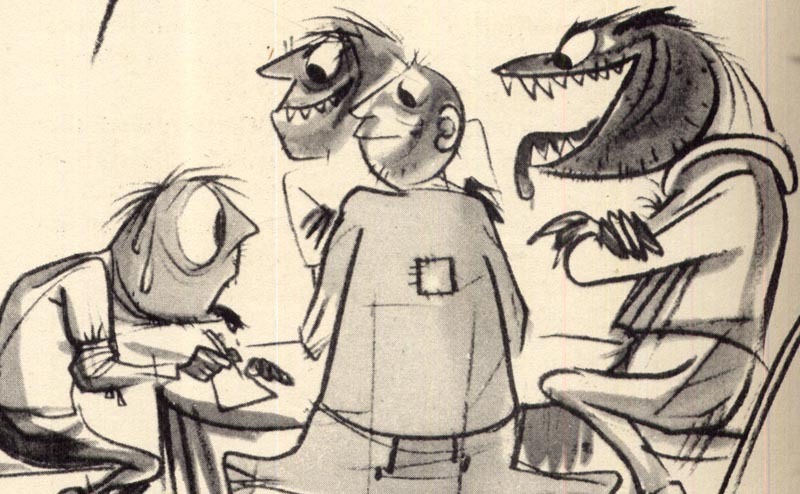 *Over on Drawger, Stephen Kroninger shares a multitude of examples of Robert Osborn's work. Well worth taking a good long look. * My thanks to Pau Medrano Bigas for his Uniroyal Tiger Paws scans which appear in today's post. Yes, I remember and that (top) commercial is awesome. I cant thank you enough for this post... He seems to be able to convey a lot with very few lines! Thank you! Thank you all for your comments. I'm glad seeing Osborn's Tiger Paws struck a chord for you. I encourage you to follow the link at the end of the post to Stephen Kroninger's Robert Osborn post - the guy who designed this amazing cartoon mascot did a lot of other incredible artwork! g r i p p i n g !! I guffawed with pure joy at seeing good old Tiger Paws again! 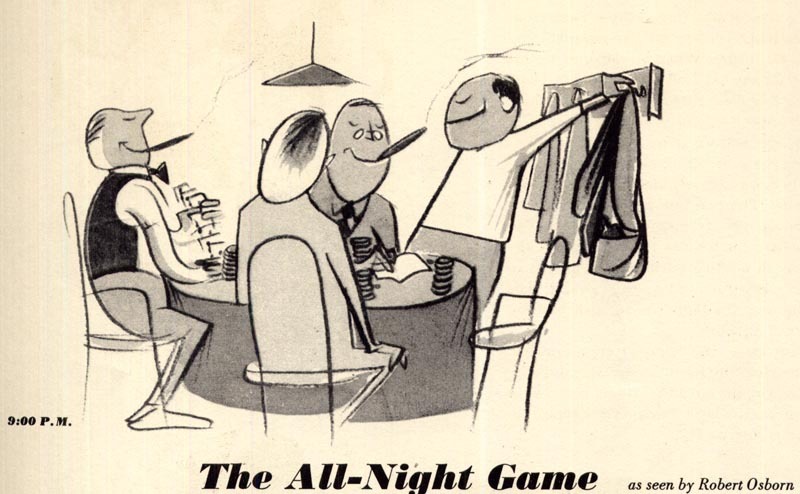 The first time I saw one of these TV ads, at age 16, I yelled, "Hey! Robert Osborn!" My parents were mystified. I'm proud to own a couple of terribly beat-up garage-sale-find Osborn books, "Osborn on Leisure," and "A New Demonology," the title of which scared the puddin' out of my first wife. 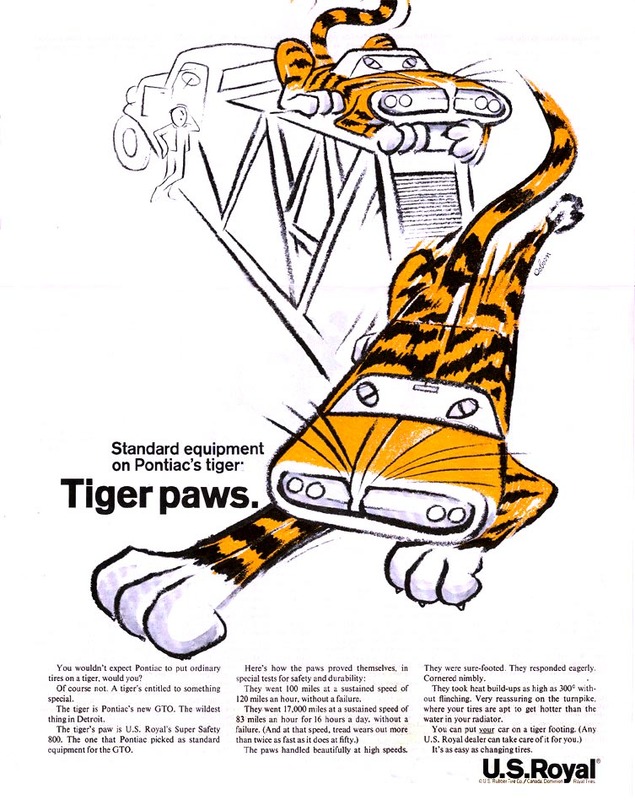 The Tiger's Paw TV commercials were animated and rendered on frosted cels singlehandedly by the legendary animator Bill Littlejohn. When they were released, animators everywhere were in awe. Littlejohn was a powerhouse of an animator. I love Robert Osborn. 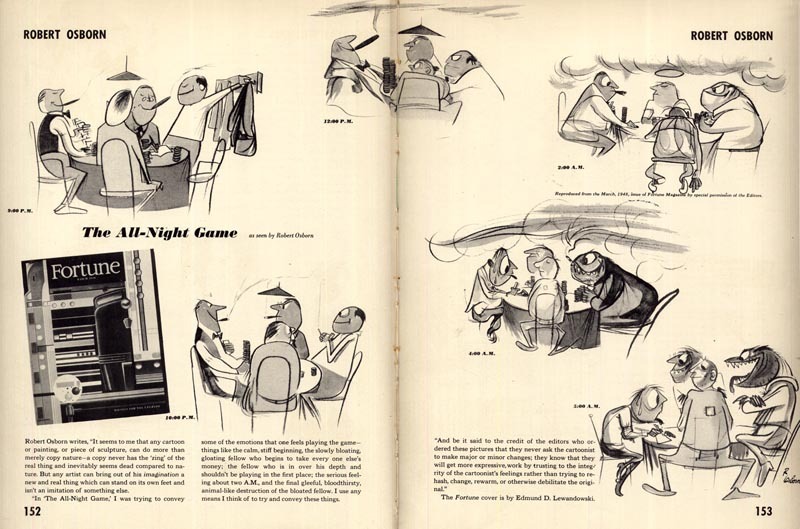 I have a collection of autograph books and also a wonderful original artist proof of the All Night Game. Sooooo cool. The music and voice-over play a very important part in the Uniroyal commercials. Does anyone know anything about the full creative team behind them? I have a Tiger Paw animation cell. I wonder what the value of it would be? I have never seen one being sold.